Our store is hosted on Siteground (siteground.com). They provide us with the online e-commerce platform that allows us to sell our products and services to you. If you would like to: access, correct, amend or delete any personal information we have about you, register a complaint, or simply want more information contact our Privacy Compliance Officer at grant@victoryalliance.us or by mail at Victory Alliance LLC. SUCCESS! Click to download your free E-Book. 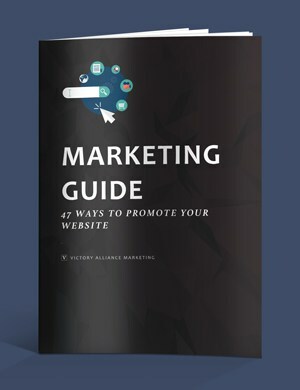 Join the Victory Alliance Marketing Newsletter and we will email you a copy of the ultimate e-book "47 Ways To Promote Your Website", plus tons of other amazing free resources, tips, and tricks. Download for free now! SUCCESS! We will send you your free E-Book shortly.